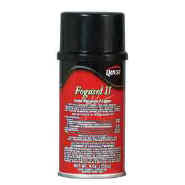 Treat up to 9,000 cubic feet with one can of Fogasol II Total Release Room Fogger. It has a special lock down valve to make sure the entire product releases into the room to kill bugs with its permethrin, pyrethrin and MGK® 264 chemical formula. Kills a long list of bugs including ants, mosquitoes, crickets, cockroaches, ticks and flies.